By Annarchy, March 17 in How Does It Grow? DH scolded them. Hopefully, they won’t do it again. That's why we have fencing around our back garden area and Abby-girl has her own "big yard". She raids the tomatoes and the berry bushes, and clod hops through everything. We tried scolding her but with her size, one trip through a raised bed and it's toast! So, we've kept her fenced off from that area plus we don't want her pooing in that area. Couldn't help myself...had to do a "little" gardening. 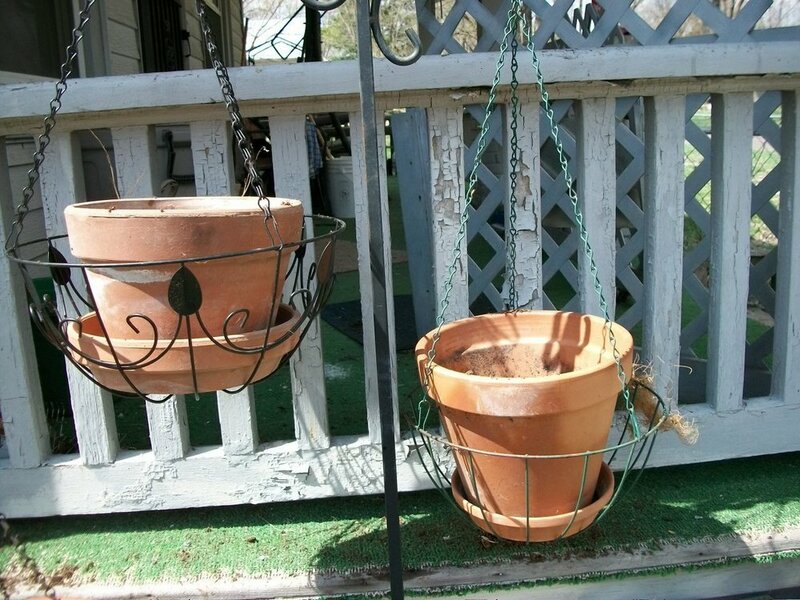 Just put in some salad stuff's in hanging pots. The seeds are several years old so maybe they will produce maybe not. 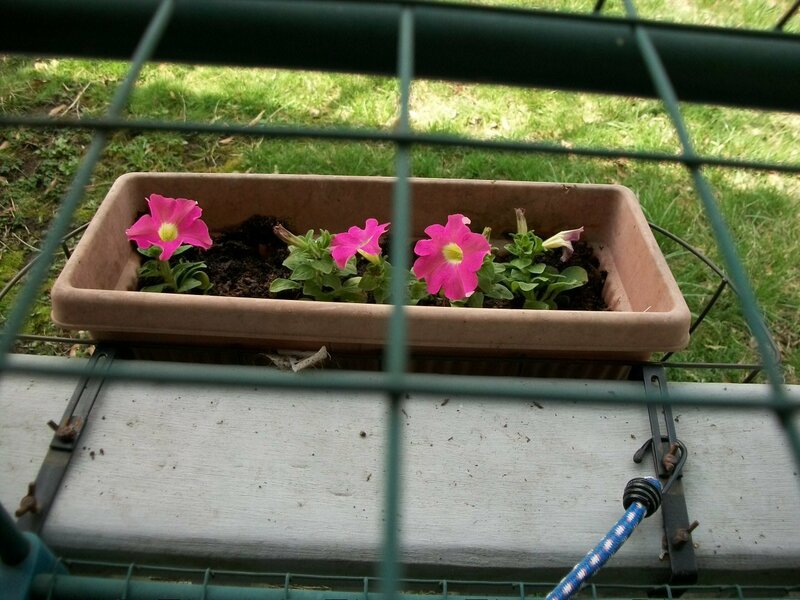 Planted some other flowers in hanging pots also. They'll hopefully be ready for the bees this year also. The Comfrey is coming back, didn't know if it would or not. The Mullein is producing all over the place. The Elderberry bush is sprouting also. Waiting for the mint in the big garden area. I want to transplant some to the front porch area. Mosquito's don't like mint. 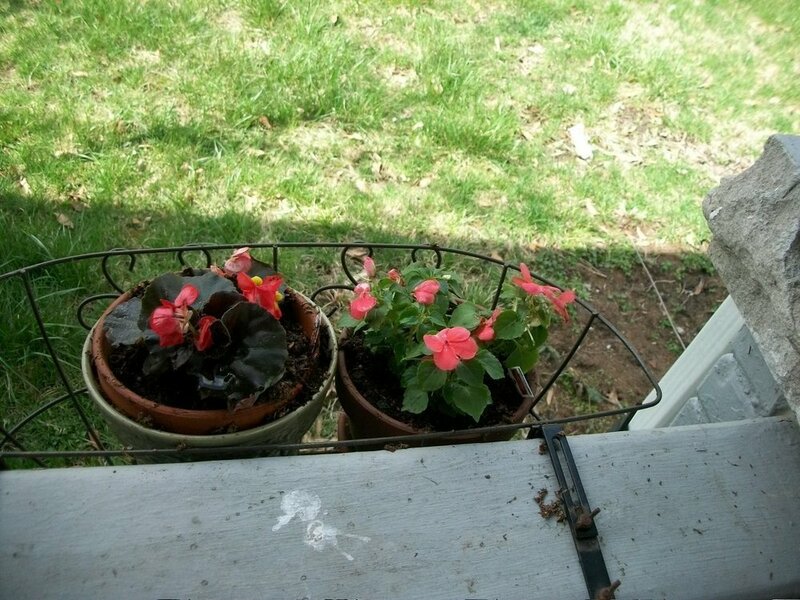 Debating on whether to plant Lemonbalm in a couple of my big decorative pots and set them by the front steps. The garlic chives are coming up and the walking onions are growing like crazy. 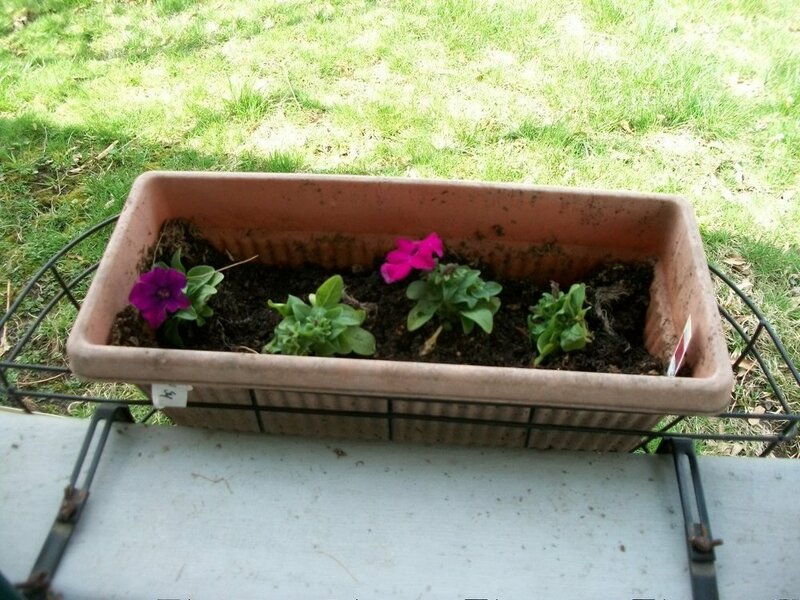 The Petunias, Begonia's and Impatience are doing wonderful. Didn't seem to mind the transplant at all. 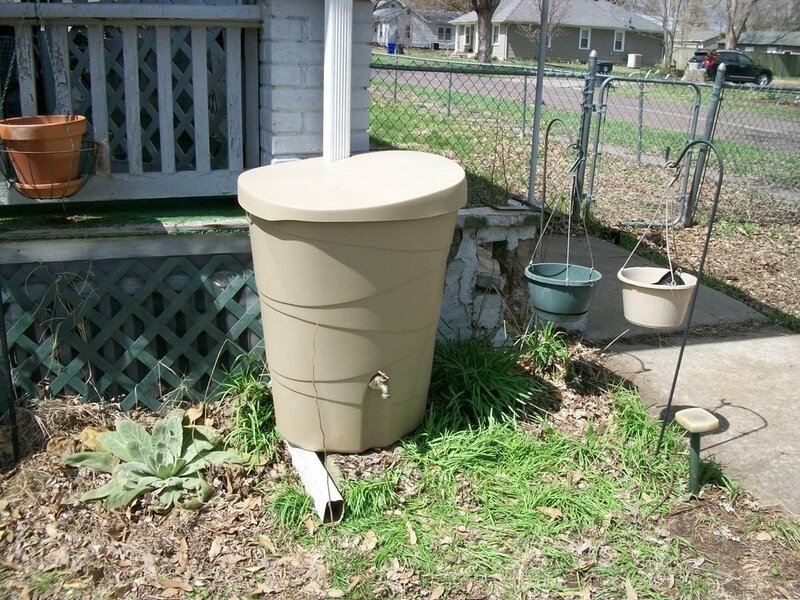 Also got the small rain barrel hooked up all by myself! Yippee! 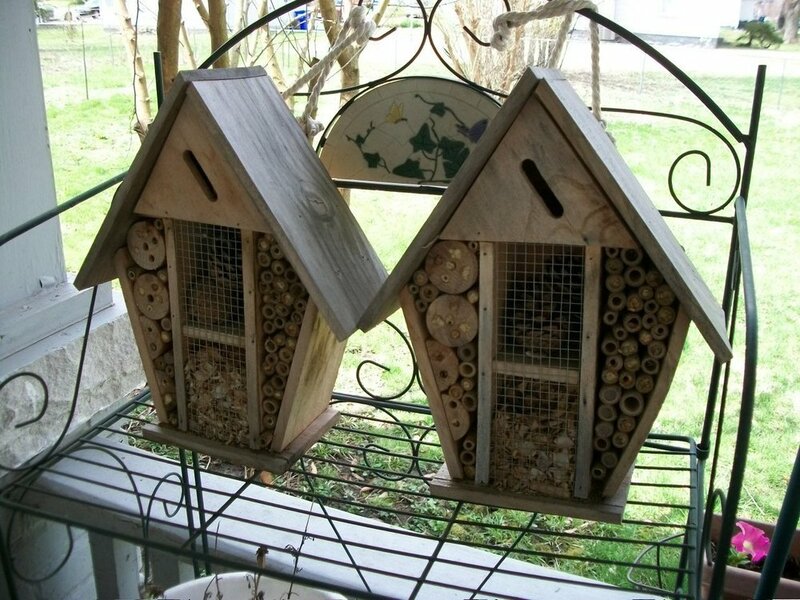 I did have hubby hang the humming bird feeders though. I don't like ladders and he doesn't want me on one. Dee-oh-geez prints.. they both are guilty. Uh-Oh. Look out little Dee-oh-geez. Momma Annie is going all CSI on you! You'd better heed Dad's stern warning talk and stay out of that garden..Next will be the sharp pointy stick waving around in the air. Yeppers, those are doggie prints alright. But guess what, Annarchy. I've had deer and even BIG OLD ELK TOES in my carrots one year. The other large self waterer I managed to claim (M grabbed of them for flowers) for my Asian yard long beans.....I've located a supposed "dwarf" variety I want to try. Picking off 4 foot tall plants beats trying to pick off an 8 foot vine. The one I have is called "stickless wonder"...we will see about that....I hope M likes them, because she loves snap beans and they all give up when our summer temps of 90+ become a daily event. It would be nice to just switch gears and eat the yard long beans instead - they supposedly thrive in the heat. So we just gotta try them. If they work well, we will plant lots more, break out the tallest poles we have, and I will can them up. 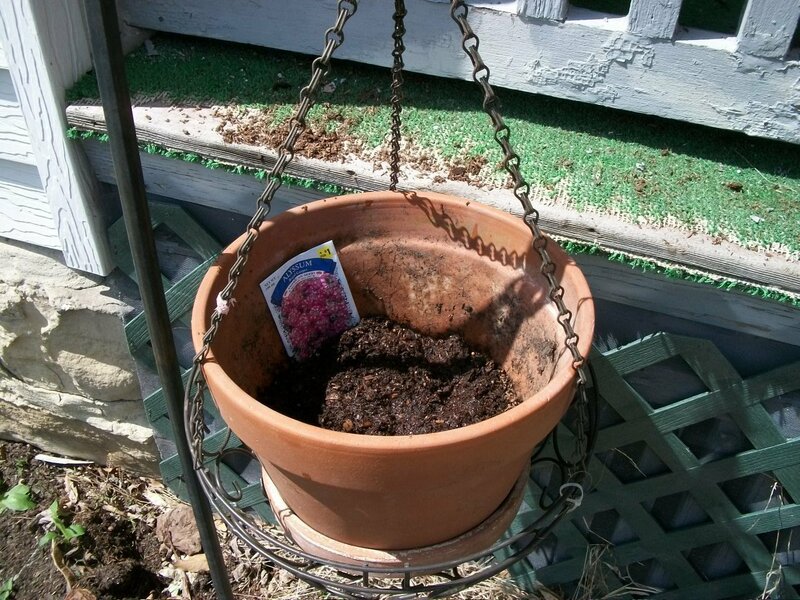 Looking for old totes around the house to re-purpose for self watering planters for herbs, too. We need more rosemary (makes a wash both healing and flea repelling for our felines). Sounds like you are making a lot of progress, Kappydell. 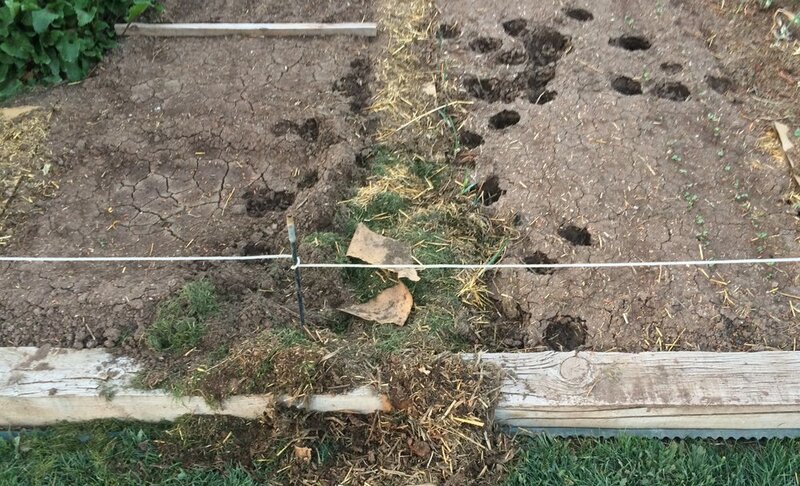 I have finally finished turning the soil in the last of my gardens. 6’x6’ triangle. Hopefully, I’ll get it planted tomorrow with corn. Corn has never done well in my yard, but I have a lot of seeds and am going to give it another try. Even if it doesn’t do well, I will be able to use the stalks as mulch. All the flowers and "tiny garden baskets" are doing great! Little green "ears" peeking out from the soil in every pot. Supposed to turn back off cold tonight but I think they'll be okay. Will watch the weather. If it's going to be "surprise" cold snap I'll set everything in under the covered front porch, out of the wind and cold. My dollar tree pots from last year wintered over nicely, too. I want to get some rosemary in its own pot though - the lemon balm is crowding it out! Pushy! Today M said she had to get more dirt. Oh? I thought we were nearly done with planting. Nope. She want to recycle our pups' wading pool into a large flower bed and get the dogs a new pool. It should hold quite a lot! Planted our shed pots, so our vertical garden is up. It only took 4 minutes for a passing driver to stop and compliment us on it. A new record! Tomorrow we will plant the 3-tier pots for either side of our front door. And M thinks she has an idea where to plant our camellias. Sat everything under the porch except the hanging baskets...I am thinking they'll be okay since the new buds are set deep into their pot. Be sure to drill the holes on the side rather than the bottom. 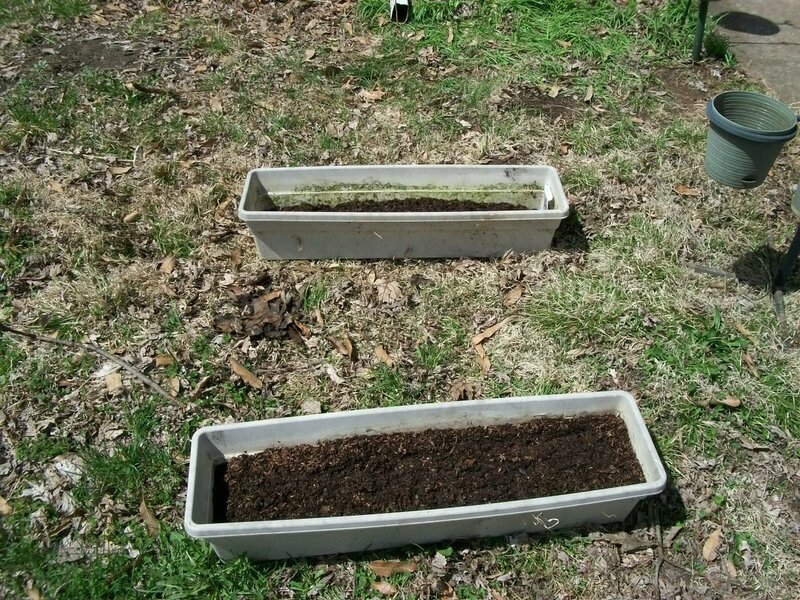 Our first ones we drilled in the bottom...and we fought constantly try to keep the soil moist and the weeds from growing up...even though we had weed mat at the bottoms. None of the tomato seeds sprouted, I’m gonna throw the rest of those seeds in the tomato area, every year I’ve tried to sprout them, nothing has come of it. If any are good, maybe.... I’m not holding any hope, we’ll see. Tomatillos, mung beans & carrots are beginning to sprout. Nothing happening in the squash area. A friend of ours was looking at the herb garden and I mentioned the difference between Greek oregano & Mexican oregano, however, I haven’t been able to find Mexican oregano plants. 3 days later, I got a package with four 3” pots! The nerd!!! We’ve known him all his life. He’s a very kind, sweet & thoughtful person. 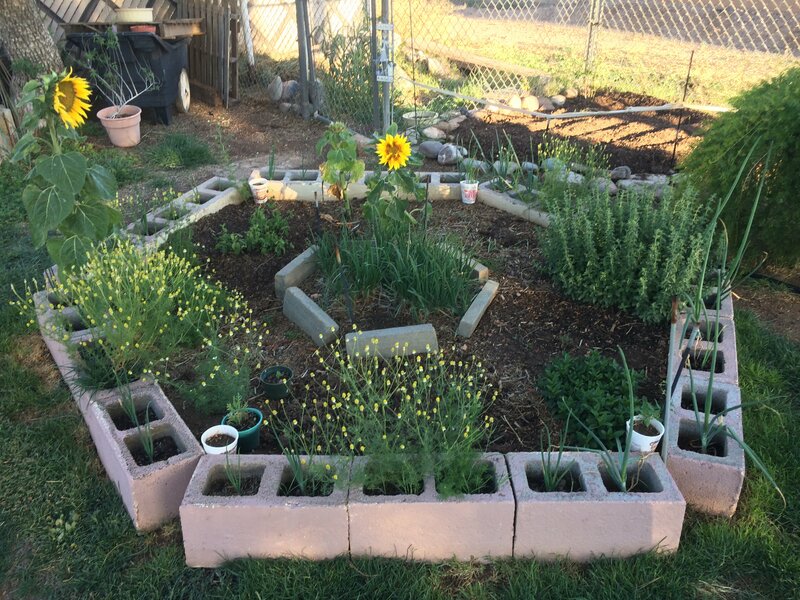 The herb garden now has both types of oregano plants, peppermint, thyme, camomile, a small sprout of volunteer, transplanted, celery (another “Thank you” to Christy, who sent me the seeds. ), Chinese garlic in the center, with garlic & onions in the block holes surrounding it. And, a couple of volunteer sunflower plants that grew from the bird seed I spread by the gate & bird water dishes. There’s room for more herbs, I haven’t decided what else to plant. There’s the corn plot in the corner, the compost is on the other side of the fence and the mulch is in the wheelbarrow. In the back corner of the corn plot, is a pequin chili plant that has survived 3 years. My first spring "picking".....mini-greens for a salad (also known as thinnings by us old timers). Mustard, collards, radish and turnip thinnings. Nice and spicy! 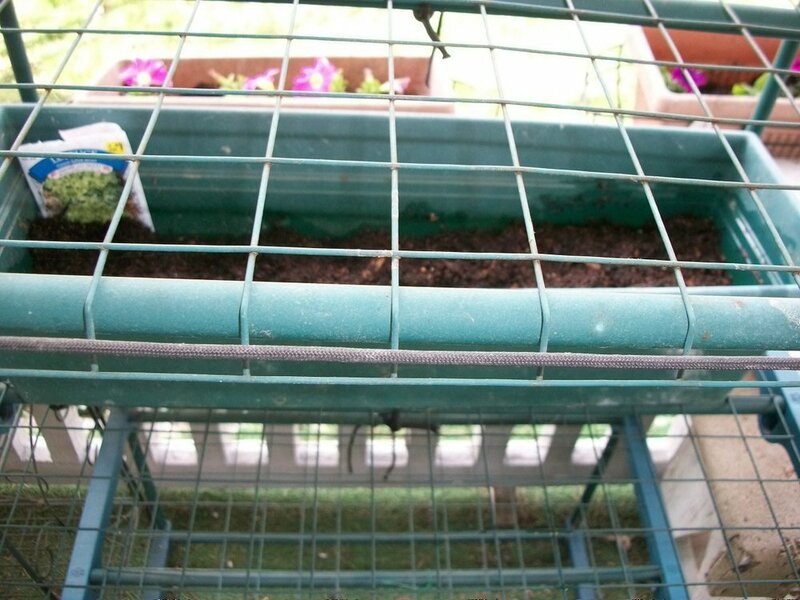 Your herb garden looks amazing. So pretty. Love the sign. My patch has a wooden gate on it and someone stenciled, "Plant Manager Wanted. 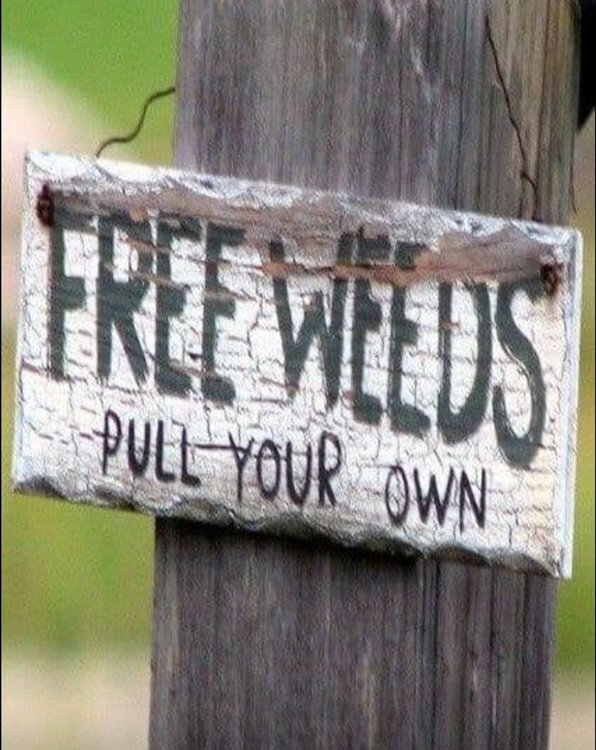 Apply Within." Lovely herb garden Ann...there's no doubt you've put some work into it.